One of the biggest inconveniences we’ve encountered over the last few months has been a result of not having anywhere to safely store tools and supplies when we are not at the farm — or even overnight while we’re sleeping! Since moving the RV to the farm, we’ve used it as storage — piling stuff in there before we leave and then having to drag it all back out again when we return. And there’s only so much we can pile in our mini living room. Even after living on our land for three weeks now, many of our tools and fencing supplies are still at BIL’s farm, in the city, or riding around in the back of my car. It is so very unproductive. We looked at metal and wood storage buildings. One big enough to double as a work-space and storage area would cost at least $6,000 and they all have windows, which makes them fairly easy to break in to. 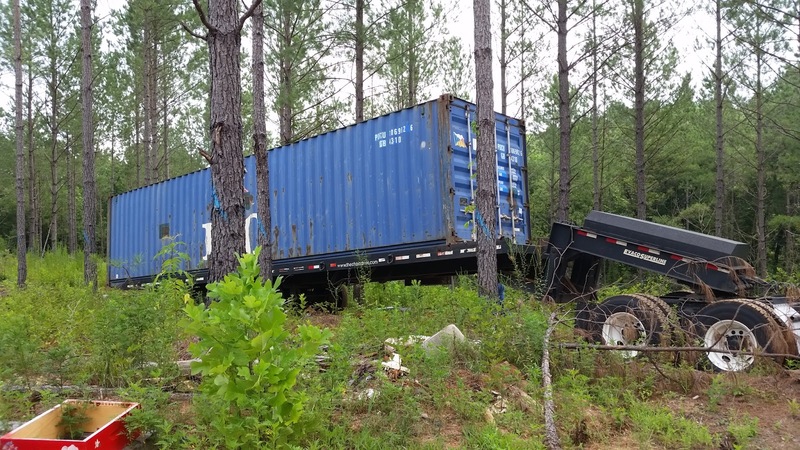 We went round and round for months, and finally settled on getting a shipping container. It is cost-effective and secure. The next step was finding a company from which to purchase one. BIL bought one in spring and had to deal with missed delivery dates and an eventual delivery that was four hours late. We were prepared for a big hassle. If we had known how easy it could be, we may have bought one sooner! We went to Jenco Sales, Inc. in Newnan, Georgia and received great service, a great price, and a delivery man who apologized for being five minutes late. I was a little hesitant when we arrived at the sales office because it looked different to what I expected, but that all changed the minute we were greeted and shown the different sizes and conditions of containers for sale. (Hubby thinks I’m crazy for expecting a car dealership type setup!) The staff could not have been more helpful and friendly. We had to cancel our first delivery date due to weather, and the company took that in stride. Hubby talked with office staff and the owner as we worked around predicted thunderstorms, and everyone was wonderful. We don’t have much in there right now, but we like knowing that it would take a whole lot of effort and heavy equipment for someone to take our garden rakes and shovels! We especially like knowing that the rakes and shovels will be in the same city as we are next time I want to plant a daylily! As soon as we arrived at the farm on Friday, the hummingbirds started chattering and darting around the almost empty feeder. We originally thought there was one pair nesting close to our RV, but there are far more than that. We so enjoyed watching their antics just a few steps away from our porch that I bought two more feeders on Saturday. We put them out as soon as we returned home, but the hummingbirds were clearly distrustful of the new feeders Saturday evening. 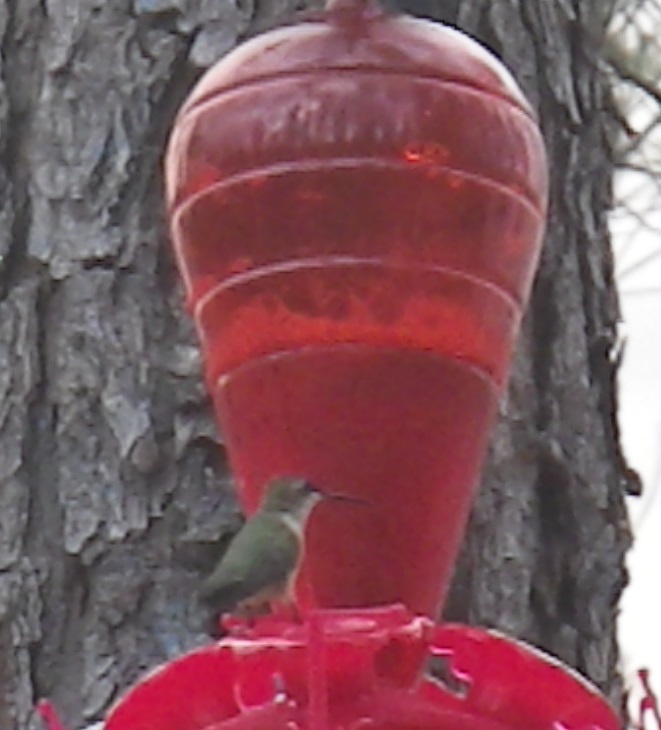 I hoped to see hummingbirds on every feeder Sunday morning, but our bees renamed them bee feeders! I guess hummingbird syrup is just as sweet as sugar water! It didn’t matter to the bees that they have their very own 5 gallon bucket of sugar water just around the corner from the hives or that they were uninvited guests at the RV. I initially thought there was a mosquito in the RV when I was making coffee, but it turned out to be the bees we could hear buzzing around outside talking about these new red, plastic flowers that appeared overnight! They then moved right in and chased the hummingbirds away. However, they were unable to reach the nectar in one feeder once all the spilled sugar water was gone, so they eventually moved away and left that one for the birds. However, they very quickly took ownership of the new feeder with a flat top. Not only did they clean up leaking syrup from a gap between the lid and the top, they were able to stick their probosces through the holes and drink to their hearts’ content. They were still their guzzling away when we left at lunchtime. Luckily for the hummingbirds, no bees or wasps were interested in the 99 cent feeder, so the birds ended up with two feeders to fight over. And fight they did. I’ve always wondered how hummingbirds survive when they seem to spend more time being territorial than drinking. There are four perches on the original feeder — why can’t they just get along and hang out together? The bees in the city and at the farm continue their feeding frenzy on the buckets and manage to drink 5 gallons of sugar water a day. It’s amazing to see; I equate it to scenes of mall doors opening on Black Friday. A year ago I would have found it terrifying to watch, but now I know they are more interested in food than in me and the biggest danger comes from standing in the flight path of a highly focused bee! The bees are also bringing back more pollen than a couple of weeks ago and the queens are laying eggs again in both locations. The first Goldenrod flowers opened at the farm over the weekend, so the bees will soon have plenty of natural food. I haven’t seen any Goldenrod around here yet, but it can’t be far behind. Why do we feed bees? Well, they would normally just stop reproducing at times like this when resources are scarce, and we are trying to increase our bee numbers before the final strong pollen and nectar flow occurs in fall. We were able to move two hives from 5 frame Nucs to 10 frame hives on Saturday, and did the same to two growing hives at one of our outyards one (very hot) day last week. If we can move into this time that resources are available with newly founded hives, they will have time to store supplies to get them through most of the winter. They more they can store, the less we have to feed them over winter, and the more food they have in December, the faster our bee numbers will grow in spring. Our focus so far has been in growing the number of bees. In spring, we’ll focus on bee growth in some locations and honey in others. 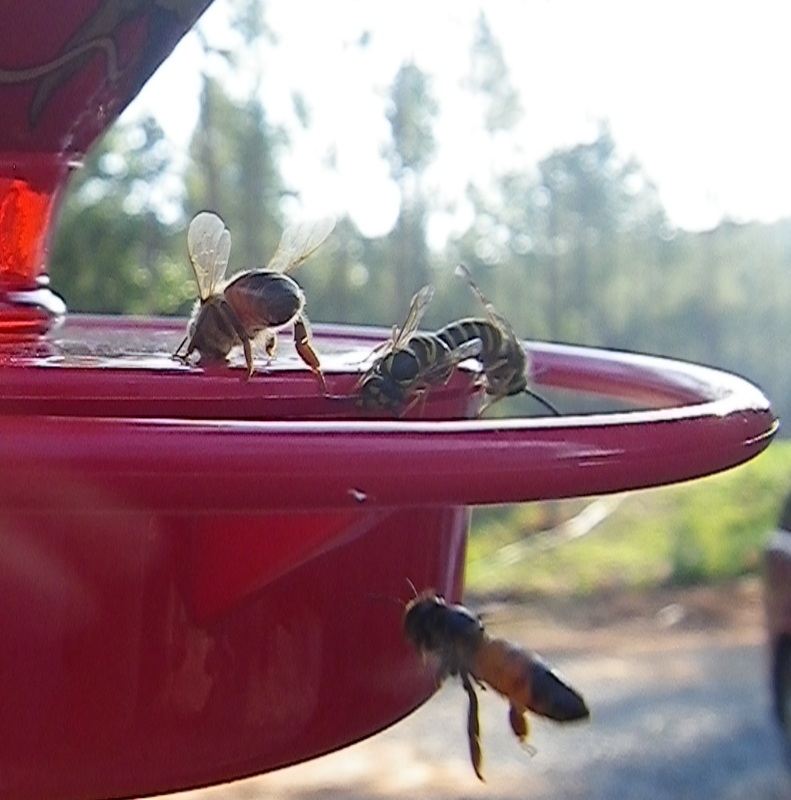 Bees drinking on flat hummingbird feeder. We had planned to take it easy last night, but the fig tree had other ideas! 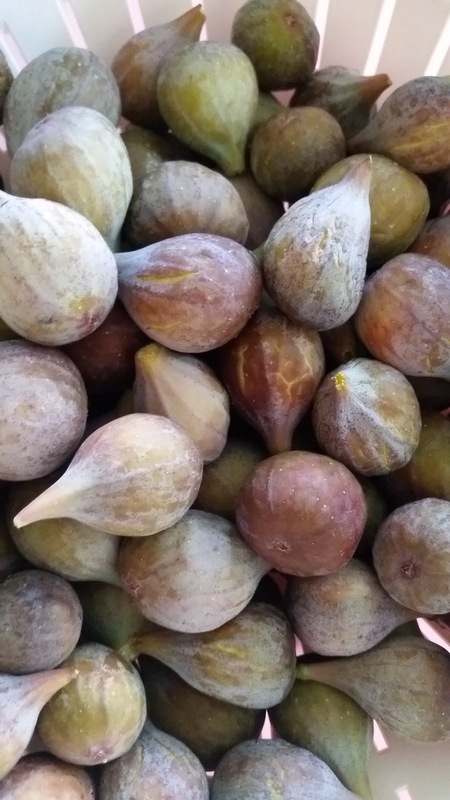 We arrived home shortly after 4:00 p.m. after driving through a thunderstorm only to find our sub-division bone dry and a fig tree weighed down with beautiful, ripe figs. We picked 15 pounds of figs in about 20 minutes, and our restful evening turned into making jam until 9:30 p.m.. I quickly loaded the dishwasher with jars to sterilize, and got to chopping and stirring. Hubby measured the sugar and we loaded everything into the new 18 quart pot. 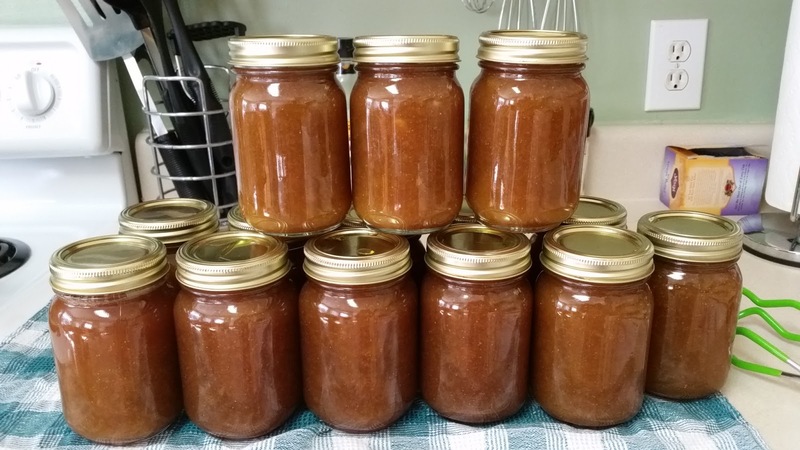 It is only logical that it takes a whole lot longer to bring that much jam to a boil than my normal 2 – 3 pounds of figs, but it turned out well in the end. Well, it turned it okay — I underestimated the number of jars I needed, so we have plastic containers of jam in the fridge for our consumption. We ran out of jam by Christmas last year; I don’t think that will be a problem this year. I am going to attempt fig jelly with the next batch, which will probably be tomorrow. My mom wouldn’t have been able to eat the jam with all the seeds, so I want to experiment with some seed-free varieties. While I was finishing up the jam, hubby installed a robbing screen on the front of the new Nuc with the found queen and topped off the Mason-jar lid feeders. As we are in a dearth, we don’t have fresh brood in other hives to strengthen this hive, and they don’t currently have enough bees to defend against being robbed by bees from other hives. We like lid feeders and top feeders because we can be certain we are feeding our bees and not every bee in a three mile radius. Bringing in “guest” bees invites robbing when feeder buckets become empty and the guests start looking around for free snacks around them. We had a busy weekend at the farm. Hubby improved and adjusted the leveling of the RV, and I planted cuttings and seedlings. I had no idea that I had 16 lavender cuttings and only two rosemary plants until I started digging holes. I know I had more rosemary when I gave a tray to one of my fellow teachers, so I must have lost some the week the sprinklers didn’t work well at the house. I stopped counting mint plants as I placed them around the RV. Their roots will help with our erosion problem and their strong scent is supposed to deter snakes! I also had some Columbine seedlings that were doing amazingly well in the heat of summer and some Echinacea seedlings that don’t seem to have grown at all in the past two months. This afternoon we need to go pick up some woodware (hive bodies etc.) 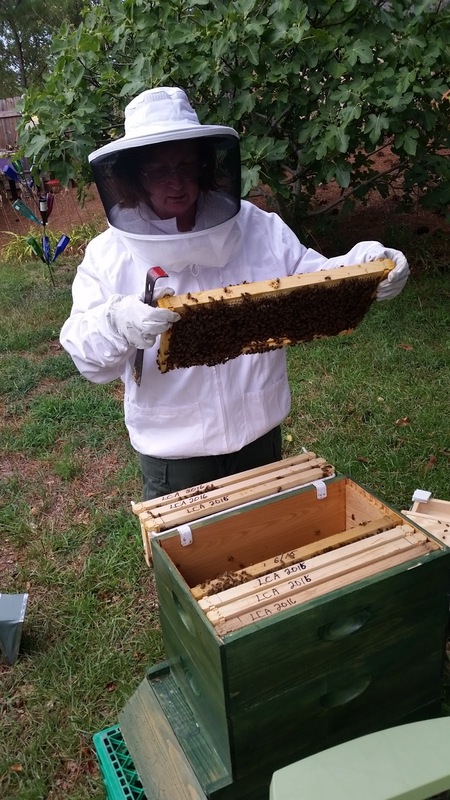 we purchased from a retired beekeeper and then go to both outyards to refill feeders, add a super to one hive, and check on a queen in another hive. We’d marked one hive as a deadout when we were trying to finish inspections right before dark one evening, but found a handful of bees and a queen still alive in the robbed-out and wax-moth infested mess the next day. We pulled some brood and nectar from our strongest hive in that yard to help get that hive going again, but the queen flew off in the transfer. (I actually caught her in my hands, but then she flew off again when I opened my hands to see what I’d caught.) We hope she made her way back home and is enjoying the top feeder. With hives in four locations, we really needed a better way of tracking inspections and our apiary to-do list. We tried a few apps, and Hivetool Mobile is working well for us as data syncs across devices, so hubby and I both have access to records. Inspections go a lot quicker when one of us checks frames and the other updates Hivetool. Hivetool also allows us to move a hive from one location to another while retaining history. Apiary Book is another good app, but data is limited to one device — it would work very well for an apiary in which only one person is entering data. In between everything else, I need to number hive bottom boards to make tracking new hives easier as we assemble them. Our quick growth has led to us being less organized about things like that than we would like, so we’re eating that elephant on bite at a time! Of course I’ve added a second elephant and am trying to write an apiary centered inventory program using Visual Basic in my spare time! I’ve joked about needing to go back to work so that I don’t have to work so hard, but I’m loving every minute of it. On the other hand, my students did very well on the IB exam and I am excited about teaching a new crew in a few weeks. 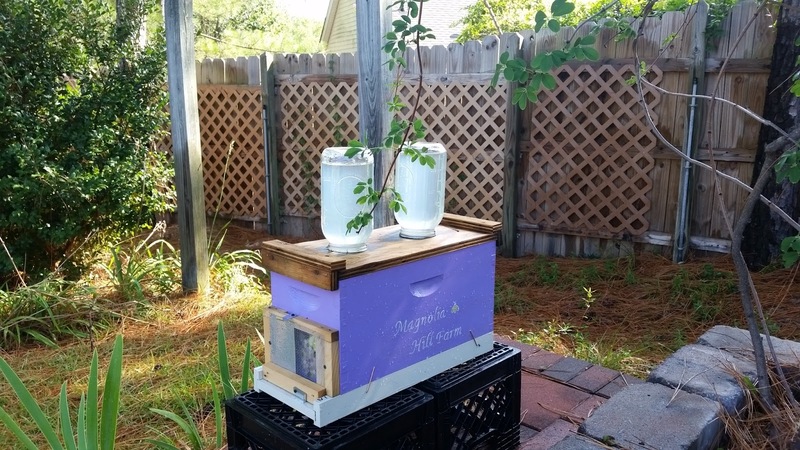 Concentrating on non-education activities this summer has revived my love of teaching, and we’ll start heading into a quieter garden and hive time soon. Our home-on-wheels is set up for relaxing get-aways throughout the school year. Life is good! Just like last year, I am back to trying to beat the mocking bird to the ripe figs by picking figs early morning and late afternoon. He gets one or two, especially the ones at the top of the tree, but I don’t mind so long as I have enough to make jam. The first batch of jam I made used 3 pounds of figs and one pound of blueberries, and I like that I can still taste the figs. In one of the batches I made last year, the blueberries overpowered the figs. It was still good jam, but I prefer this batch. The second batch used one pound of figs and one pound of strawberries. I also used one cup of honey and one cup of sugar instead of two cups of sugar. The fig/strawberry mix is good and there is just a hint of honey flavor. We both really like this recipe, but strawberry jam doesn’t set as easily, and I’d like the next batch to be a little firmer. I used some pectin, but clearly not enough! Today I used the same Drunken Fig Jam recipe that everyone liked so much last year, but I substituted honey for half the sugar. We couldn’t taste the honey at all, so I will just use sugar next time. It makes more sense to keep honey in the pantry than to hide it in jam. I’ll make some more batches of the original recipe, but then I plan to experiment using Stevia for a lower calorie version. Between checking hives, feeding bees, and making jam, I have no time to get bored at all. Summer is flying by, and we have to stop to consciously look at what we have accomplished rather than focusing on what we have not yet even started. 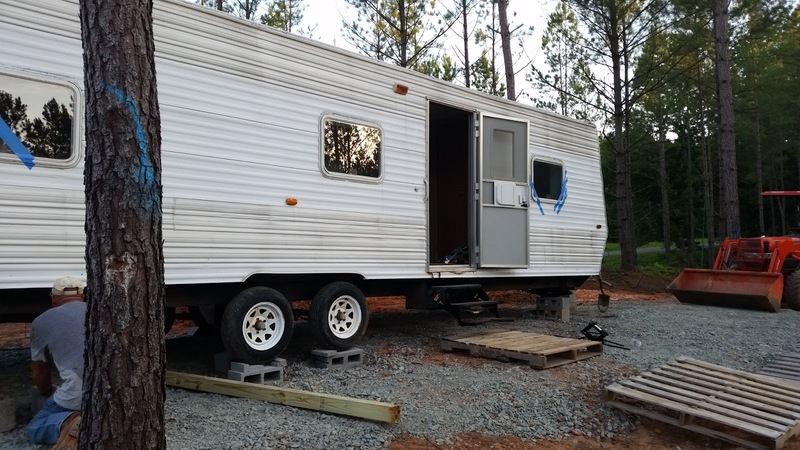 RV moved onto our land. Thanks to BIL, BIL’s friend, and BH, our RV is now on our land and we went to sleep and woke up looking at tree tops — our tree tops! Having never moved an RV before, I don’t know if it’s always such a bear to get one set up, but I do know that the new scissor jack that looks prettier than the others but refuses to work makes everything more complicated. We also thought the pad was more level than it actually is, so if we ever do this again I’ll actually break out the level and see where we may need to add more gravel before parking the behemoth. We’ve enjoyed sitting outside drinking our morning coffee and sitting outside at the end of the day watching the sun set. It’s easier to notice all the wild life when we just sit still for a while. We’ve also withstood our first thunderstorm, so we know that the fibreglass remained intact over the leaky roof bits. We still have the other roof coating to put on, but it requires 24 hours of dry time, which means that we won’t be able to run the A/C once we paint it on. The plan is to put it on when we have a dry morning before heading back to the city. The plan may turn into putting it on when it’s cool enough to not need A/C. After working outside in 98 degree heat the last few days, that sounds like a better plan to me. Being out there first thing in the morning made it easier to check on our bees. All of the hives except one are doing okay, but the dearth is definately upon us. The queens are not laying and there is very little nectar in the hives. There’s still pollen coming in, but no nectar. We found the same thing happening when we got back to the city, although one queen is still laying well. The new queen in my English hive is very active, but has not laid any eggs yet. We put some sugar water out and hope that jumpstarts all the queens. We had opened the English hive shortly after our new queen had hatched. It was clear that she had dispatched most of her sisters, but there were two queen cells intact that we had hoped we got to before she did. No dice. The two-frame section of the queen castle in which we installed the cells with a couple of frames of bees from another hive contained only a few dead bees, some hive beetles, and wax moth trails. We were disappointed and took the frames over to the shed so that we could put them in the freezer as soon as we took the suits off. Hubby put the smoker and hive tool up, took off his jacket, turned around to pick up the frames, and, lo-and-behold, there was a brand new queen searching the frames. Of course, all the queen isolation stuff was in the garage, but we did manage to get her into a queen cage and installed into the castle with a couple of frames of bees, larvae, and honey. We’re pretty sure we have a drone congreation area in our yard as we have found an abnormal number of queens and I’ve even had mating bees clinging to my tshirt! Finding the queen would have been enough excitement for one day, but we also picked 3 pounds of figs that ripened while we were gone. I currently have mason jars sterilizing in the dishwasher and will start making jam just as soon as I finish my second cup of coffee. I want to try using honey instead of sugar (or using a mixture of the two) this year, but I’ll do that with a small batch later. Honey-whiskey ribs are already a big hit in our house. I have an entire book of honey recipes to try, so we’ll keep feeding the bees in hopes that they will feed us in return. A few weeks ago, hubby dug the trenches for our water lines. The piece of equipment he wanted wasn’t available, so he got the Terramite backhoe way in the back of the picture to the left. It managed to dig out the packed clay, but stumps defeated it. Our wonderful neighbor, BH, came over and offered us the use of something a little bigger. Hubby had lots of fun digging with this one and managed to get over 400 feet of trenching done in two days. We finally have the right water pipes, have them installed, pressure tested for leaks, marked well, and we are ready to fill in the holes. The first thing we tackled was the break in the driveway as we either had to carry everything over the trench or take the long way around with the four wheeler — which I won’t drive cross-country! I’m still getting used to it and have only reached a maximum speed of 7 m.p.h. on the driveway so far. 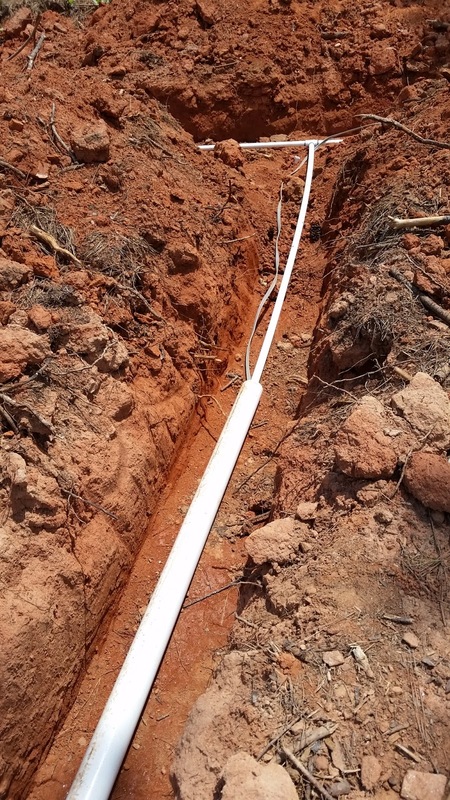 BH suggested that we feed our water and power line to the well through a larger piece of PVC pipe in order to protect it some from the pressure of us driving across the section that runs under the driveway. 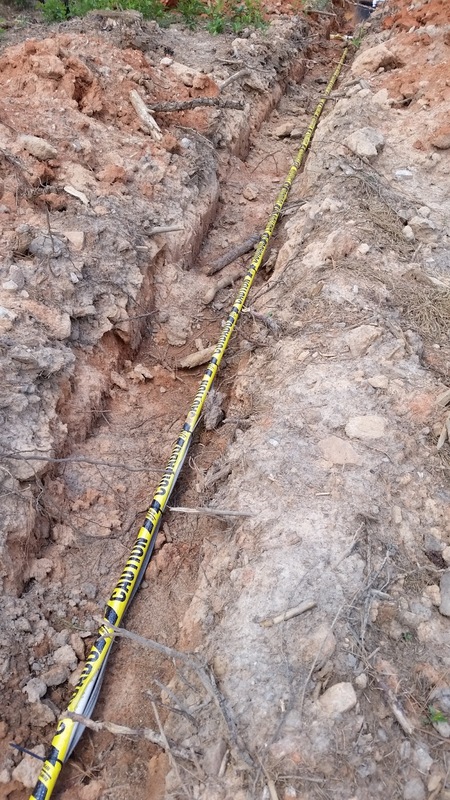 Most of the damage he sees to underground pipes stems from rocks abrading the plastic and that is more likely to happen under a heavily traveled area. Other suggestions that he made were to wrap the pipe in caution tape and tie wrap the electric line so that it stays under the pipe. That way, if we forget where the lines are and start digging, the first thing we’ll hit is the water and that’s only if we don’t notice the caution tape. 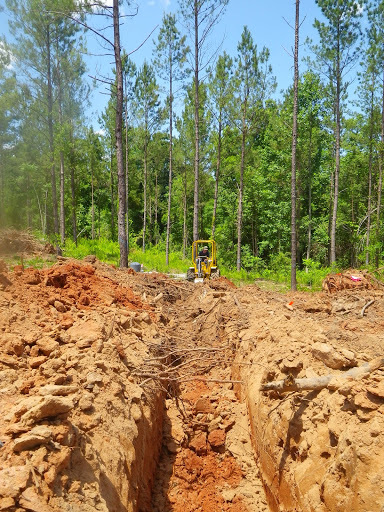 The next step was to rake soil around and under the pipes so that when we backfill the trenches, the pipes are supported and the soil immediately around them is clear of rocks. That was my main job today, and I only got a short run finished. Guess what I’ll be doing tomorrow? Hubby rented a soil compactor so that the driveway remains stable over the long haul. Haul is a good word as we pretty much had to haul the darn thing up the trench and sometimes give it a helping hand on the downhill run too! That’s why I’m back at the RV typing instead of still digging and raking out in the 97 degree weather with the men. (8 hours of that was enough.) It was an interesting and tedious experience, but I know that section of driveway isn’t going anywhere. The outdoor water faucets hubby installed drain when you turn them off, releasing the water back into the soil and preventing the faucets from freezing. They are available in a variety of lengths so that they can be buried deeper in colder regions. The ones we have are buried two feet in the ground. The base is surrounded by drainage rock so that water can drain easily, and hubby covered the exit with fabric to prevent dirt and roots from entering. 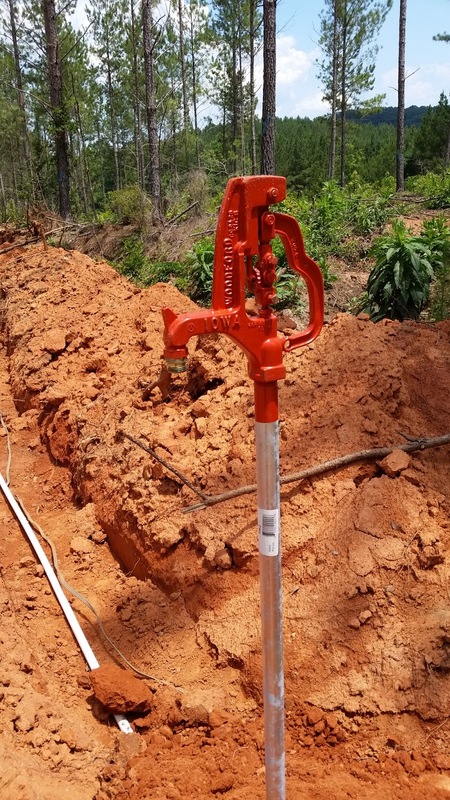 We have other faucets at intervals along the long run of pipe so that we can attach drip irrigation lines eventually, but the main water sources for the RV and the workshop are these very robust ones. (The drip irrigation faucets will be low to the ground and easy to cover in winter.) Another of BH’s suggestions for these long runs of pipe was to install telescoping repair couplings at intervals to enable expansion and contraction without the pipes having to bend. This afternoon pipe that was straight in the morning was significantly bowed by 3:00 p.m. and the installation of couplings like these took care of that. This style was the third filter we tried on the irrigation well at our house after having non-stop problems with sprinklers not shutting off and other zones not turning on. The more traditional filters clogged too easily with the fine sediment, but this one worked perfectly. It also doesn’t require any additional purchases, like replacement filters. When it becomes clogged, simply turn the handle and it flushes out. We had to do this multiple times a day for the first month we had the irrigation well, but only flush it a few times a year since we had a heavy rain flow that apparently flushed out the water table. 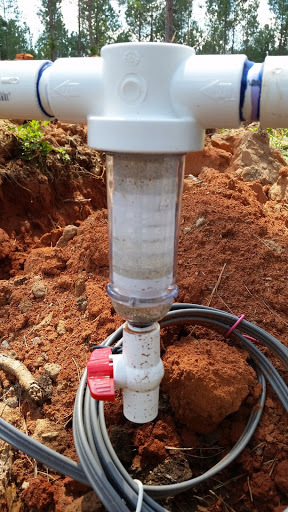 We have a bucket with gravel underneath it as water rushing out onto bare ground created a muddy mess, but we have been very happy with the system. 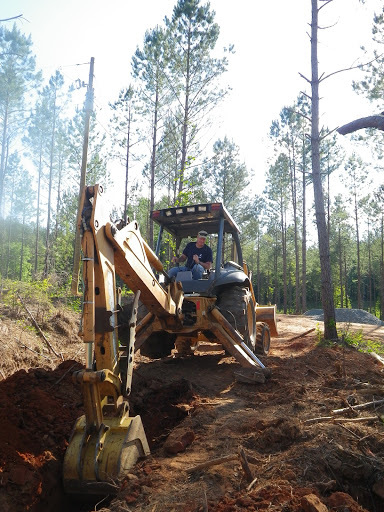 When hubby rented the soil compactor from Taylor-Foster Hardware, he also rented an Outback Brush Cutter for me. My first hour with it was a little hair-raising as I felt like it was in control and was intent on dragging me into the woods! After that, I simply slowed it down to a pace at which a snail could have easily passed me and then I didn’t stop until it ran out of gas. It did a great job clearing brambles and other weeds. I’d planned to use it along our fence line today, but never made it out of the trenches until I made my escape to the air-conditioning. (I’m preparing to teach a unit of World War I poetry, so thoughts of trench warfare are always hovering around somewhere in my brain.) The brush cutter certainly did a better job than the weedeater and in less time. Each one puts a different muscle group to work, so maybe I need both after we find gold and can afford a $5,000 piece of equipment! 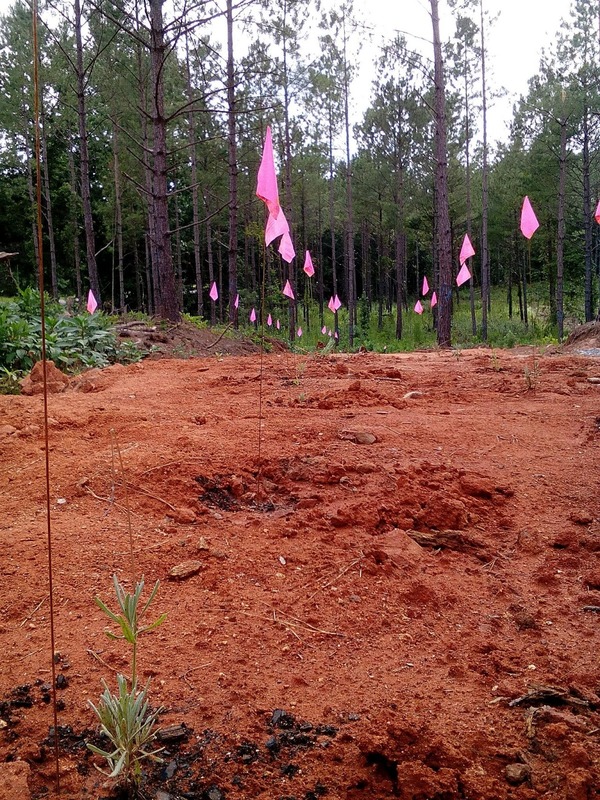 Until we find that gold, we’ll definitely keep renting equipment and shopping for supplies at Taylor-Foster in Manchester, GA. The people there are always so friendly and helpful and they have an amazing selection of supplies for a small town store. They also have an ice-cream freezer right next to the checkout counter, and you won’t find that at the big box stores. We bought plumbing parts yesterday and then bought strawberry shortcake ice cream bars for lunch! The bees continue to do well here and are bringing in lots of pollen. The city bees abandoned my lavender for Echinacea while we were away. 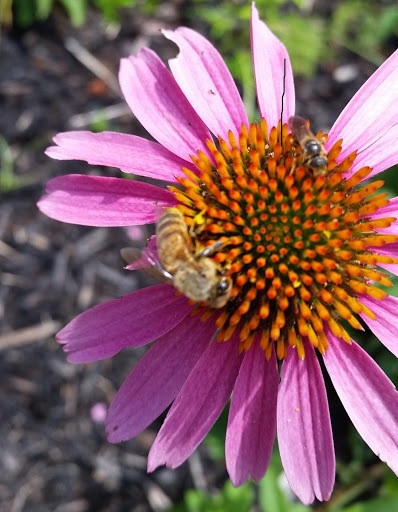 I spotted 5 different bee varieties on the Echinacea and Pholx in just a couple of minutes. The bees are happy. We are happy. Life is good!